Electrical wires, connectors and other parts, produced through advanced technologies and differing in type to meet specific usage, functional and geometrical requirements, are manually assembled into a wiring harness in the final stage of production. 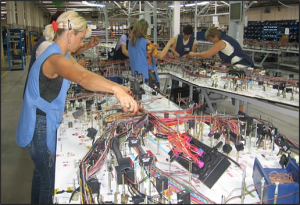 To optimize Group production worldwide, more than 130,000 employees are engaged in wiring harness production in more than 30 countries. The slogan “globally common best quality” is intended to eliminate variations in quality that may occur among individual workers and countries. Accordingly, a simulation system that enables engineers to conduct virtual analyses and verification of plant layouts and production lines has been introduced to create high-quality, high-efficiency production systems.